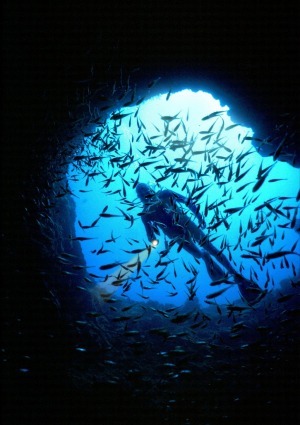 Marine sanctuary: There is nowhere else quite like this wildlife haven. 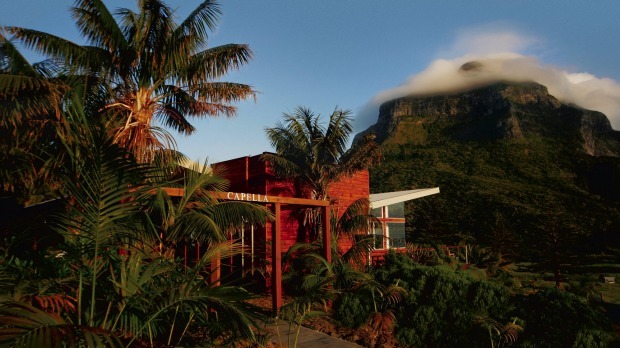 The lap of luxury: Capella Lodge on Lord Howe Island is tucked into the hillside and hidden by a thicket of shrubbery. 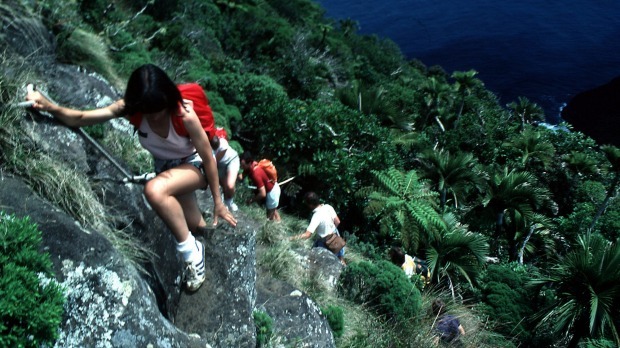 Steep descent: Climbing Mount Gower on Lord Howe Island. "Woo … hee! Woo … hee!" Our guide Dean Hiscox is shouting at the sky, which is alive with providence petrels. These migratory seabirds nest on the ground, he says between screams, and will often investigate unfamiliar sounds near their burrows in case their eggs or chicks are in danger. Sure enough, the petrels circling the mountaintop we're on start gliding past lower and lower, almost skimming the tops of our heads until, suddenly, it's raining birds. They fall out of the sky, soft-landing in the long grass at our feet, grey-black wings dragging behind them as they walk about, clambering over our boots, seeking the source of the nuisance noise. 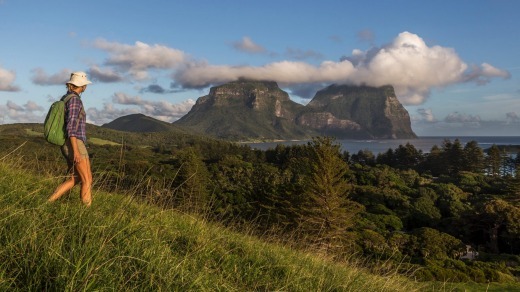 Lord Howe Island is the only place in the world you can see this avian spectacle, but it's just one of the natural highlights on the island's new Seven Peaks Walk. Walkers descending from Goat House Cave on Mt Lidgbird. 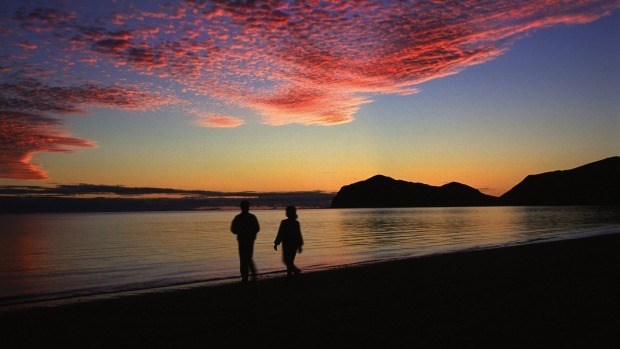 It'd be easy to underestimate a five-day walk on an island barely 10 kilometres long. 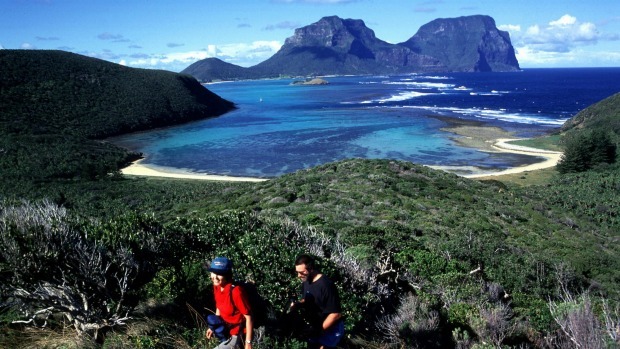 But this new addition to the Great Walks of Australia collective offers 45 kilometres of world-class hiking (the average length of the other gourmet guided walks in the group) and more vertical gain than Great Walks big shots such as the Overland Track and the Larapinta Trail. It differs from its 11 Great Walks siblings in one important way, however. Instead of staying in huts, safari tents or ecolodges, Seven Peaks Walkers stay at the 75-bed Pinetrees Lodge, voted best hotel in Australia by TripAdvisor earlier this year. Not that it doesn't still feel remote. 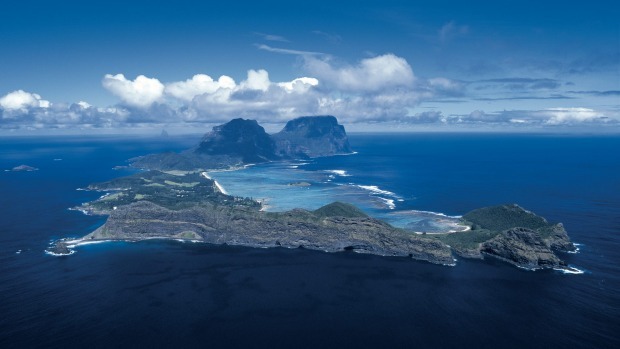 Pinetrees is, after all, on a World Heritage-listed island 600 kilometres east of mainland Australia, where your smartphone won't work and there's no Wi-Fi. It's also the kind of place where nature follows you home after a day on the trail. 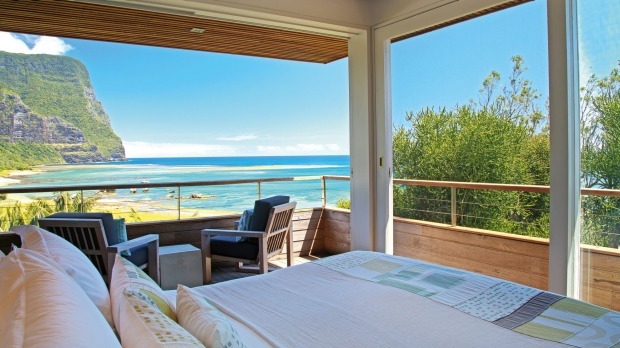 Nestled amid 100-year-old Norfolk Island pines, across the road from the island's gin-clear lagoon and a short bike ride from anywhere, its beach-chic rooms feature coral-print cushions, louvre windows that let in the sea breeze and lush subtropical gardens. I'm on the inaugural Seven Peaks Walk, which kicks off with a pre-dinner briefing over glasses of wine with our other guide for the week, Pinetrees director Luke Hanson. 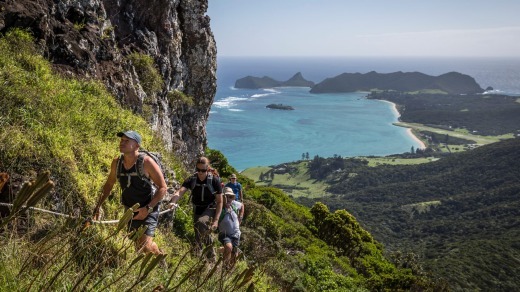 "There are actually eight peaks, so we have one up our sleeve," he says, if the weather doesn't play nice or if any of us choose not to climb the island's highest peak, Mt Gower. 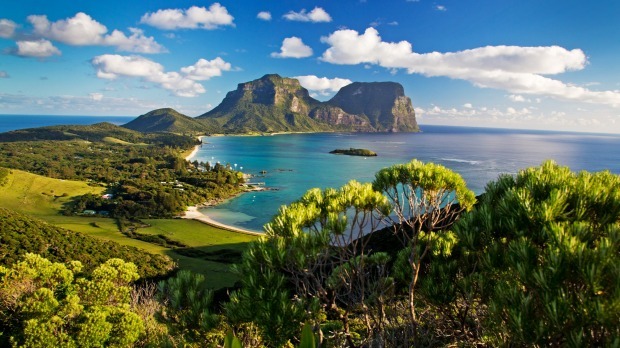 Speaking of weather, predicting it is an art on Lord Howe, which lies within a sort of meteorological Bermuda Triangle – the nearest weather stations are at Port Macquarie, New Zealand and Norfolk Island, 600 to 1400 kilometres away. 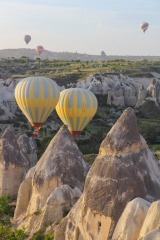 So we won't know which peaks we'll be tackling each day until breakfast that morning, which dials up the adventure. 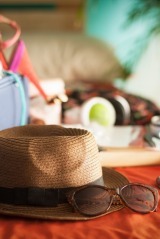 The plan is to walk for four days (trips run Monday-Friday) and have a "rest" day to explore the rest of the island. As it turns out we walk every day, sometimes just for half a day, and still have time for non-walking adventures. Day 1 starts with one, in fact: a half-hour glass-bottom boat ride to North Bay at the northern end of the lagoon. 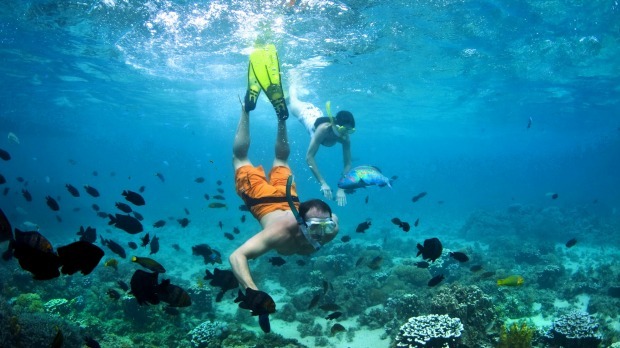 We see so many tropical and subtropical fish and turtles it's like snorkelling without getting wet. 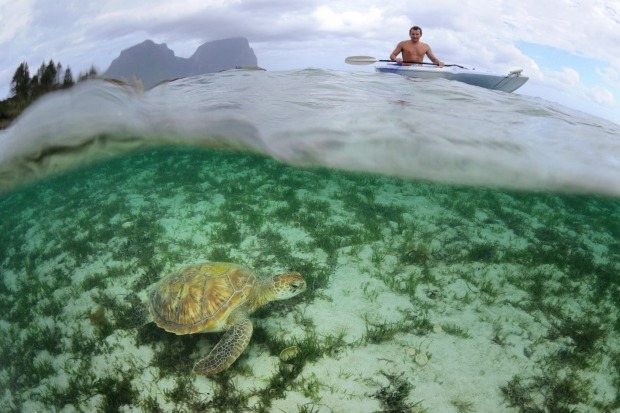 Being on the water also helps us get our bearings. 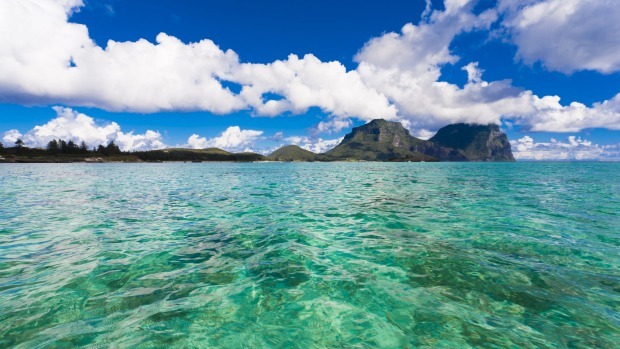 "It's not until you get onto the lagoon that you realise how big Lord Howe is," says Hiscox. 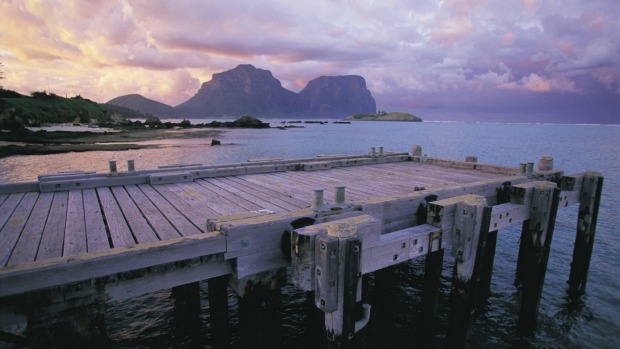 Behind us the island's twin peaks, Lidgbird and Gower, dominate the southern skyline. 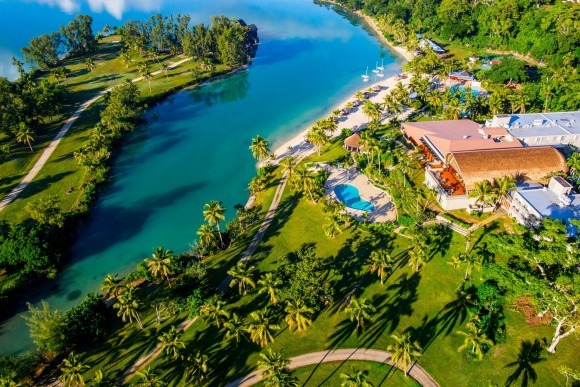 "A third of the island's land mass is in those mountains." Guide Dean Hiscox leading the Seven Peaks Walk group up to Goat House Cave. At North Bay we step onto a sandy beach devoid of footprints and Hiscox puts on a leather tool belt containing secateurs and a bush knife. Huh? "I just do a little 'bush maintenance' as we go," he explains. Hanson translates: we're going off-track. This is one of the best things about the Seven Peaks Walk: it doesn't just cobble together day-walks you could do on your own. 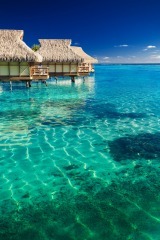 It takes you to places you'd never see otherwise. 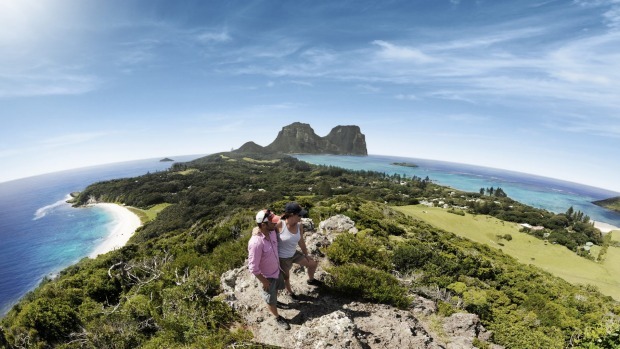 Lord Howe is ideal for off-track hiking, by the way. Louise Southerden walks back to Pinetrees, Lidgbird and Gower in the background. 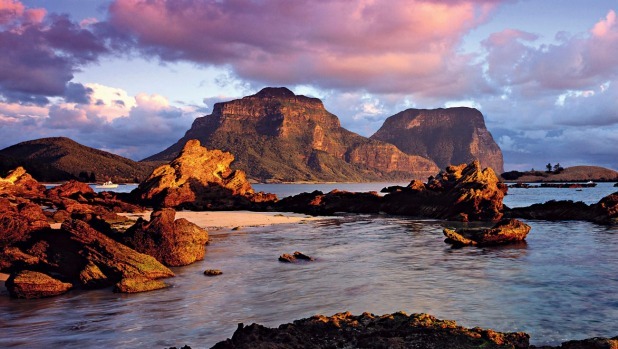 Unlike mainland Australia it has no poisonous snakes or spiders, no ticks, no leeches, no stinging nettles. It's impossible to get lost with Gower and Lidgbird visible from almost everywhere. 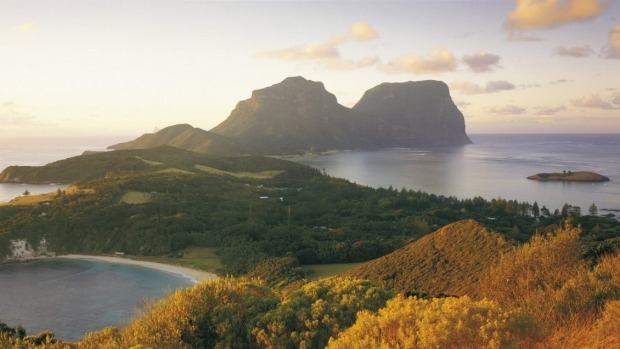 And you can travel light: because of its subtropical climate (Lord Howe is level with Port Macquarie but warmed by tropical waters) and unpolluted streams, you never have to carry much gear or water. Less than an hour after leaving the beach we're standing on North Head while hundreds of red-tailed tropicbirds wheel overhead and flutter around their nests in the sea cliffs below. It's more of a headland than a peak, but we're lucky to be there: it's inaccessible without a guide and completely off-limits in summer when nesting sooty terns carpet the ground. 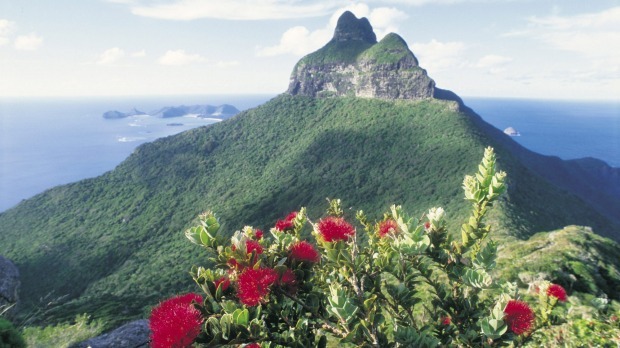 Lord Howe Island, Seven Peaks Walk. 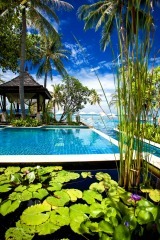 Besides, the views are sublime. Hiscox counts off the island's other peaks from left to right, north to south. Ranging from a modest 121 metres (Transit Hill) to Gower's summit plateau 875 metres above sea level, they're all that's left of a giant shield volcano created almost seven million years ago when the Indo-Australian tectonic plate moved over a hot-spot in the earth's crust (much as Hawaii and the Galapagos Islands were formed). The Seven Peaks Walk does have one thing in common with the other Great Walks of Australia: each day is bookended by creature comforts. 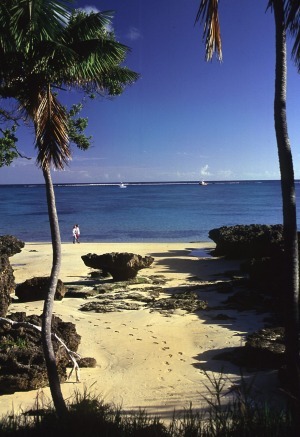 Most mornings we don't set off until 9am so there's time for a dip in the lagoon or a walk on the beach before cooked breakfasts and lattes. At the other end of the day we're back in time for afternoon tea at the lodge or, failing that, sunset drinks on the deck at the Boatshed, a Pinetrees institution. The group edges along rock ledges to the Herring rock pools. One evening a few of us have a sunset swim as well, the water a golden shimmer around us. 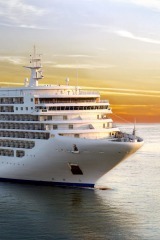 Then there's dinner, a four-course affair created by Pinetrees' chefs, many of whom have worked in Sydney's best restaurants: nori-crusted king prawns, perhaps, followed by grilled Lord Howe Island kingfish, red wine-poached pears and a platter of Australian cheeses. 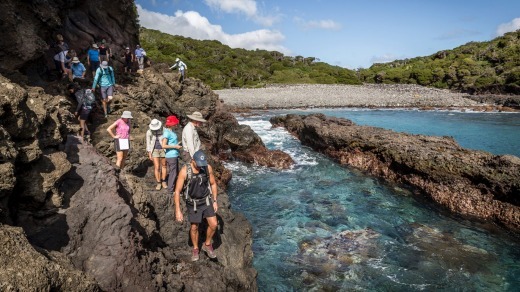 One of the surprises of the Seven Peaks Walk is how many non-walking activities we fit into the week: a morning snorkel with Galapagos sharks on the world's southernmost coral reef, barbecue lunches at Ned's Beach where we stand knee-deep in the shallows hand-feeding friendly silver drummer, swims in dreamy rock pools. 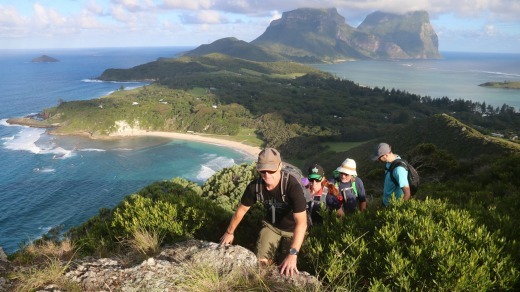 Another surprise is that we tick off six peaks in our first three days, leaving two days to tackle Lord Howe's two "real" mountains. Lidgbird's 777-metre summit is out-of-bounds: there's no track and reaching the top involves some technical climbing; even Dean has been up there only a few times. But we can get to Goat House Cave halfway up, which we do on Day 4. 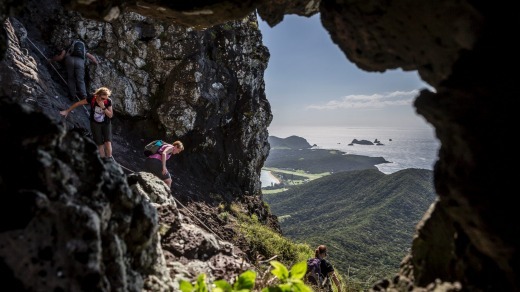 The track is steep, but short (only 4.2 kilometres return), so by 11.30am we're having an early picnic lunch on a sun-drenched ledge outside the cave taking in what seems like an aerial view of the entire island. Then we have a free afternoon, which some of us use to full advantage – by relaxing in the Adirondack chairs on the lawn back at Pinetrees in preparation for climbing Gower the next day. "Why are you doing it again?" asks one of my fellow walkers, Luka from Melbourne, wondering why anyone would submit to such an ordeal more than once. It's a question that goes to the heart of what the Seven Peaks Walk is all about. Sure, counting mountains is fun and a good way to measure your progress in the absence of an end-to-end track, but this trip is really a way to experience feet-first the little island Sir David Attenborough once described as "so extraordinary it is almost unbelievable". 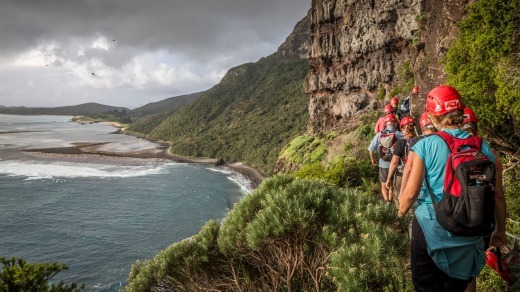 And Gower is hands-down the best hike on the island, a pocket-sized adventure that takes you right to its wilderness heart – though I start to doubt my resolve when the alarm goes off at 5.30am the next morning. An early start is part of the deal and the only way to get to the summit and back before dark. The weather gods give us a perfect day for it. 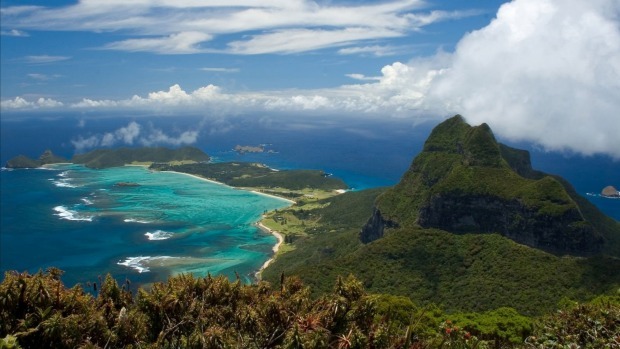 It's all sunshine and waterfalls, wild orchids in bloom, views to Balls Pyramid (an eerie rock spire 23 kilometres south of Lord Howe) and, when we finally emerge at a clearing in the Tolkienesque cloud forest on the summit plateau, those providence petrels Hiscox calls to earth. "I didn't expect to walk so much – or eat so well," says Luka at our celebratory dinner that night. His wife Dora later emails us all to say they'd gained "two kilograms of happiness in one week at Pinetrees". 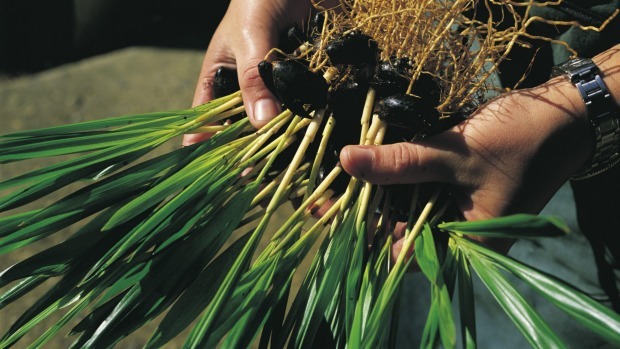 The Seven Peaks Walk is more than just another gourmet guided walk. It's a week of natural highs in one of the most pristine places in the world, a week that walks you back to a simpler, less complicated time, all in an environment so benign you have to keep reminding yourself you're still in Australia. Just watch out for falling petrels. 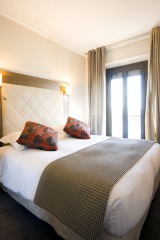 Louise Southerden travelled as a guest of Pinetrees Lodge. 3. 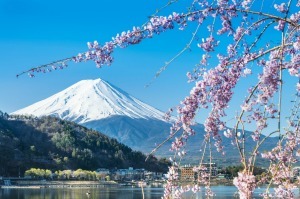 The State 8: The highest peaks in each state include Mt Ossa (1614 metres, Tasmania), Mt Bogong (1986 metres, Victoria) and of course Kosciuszko (2228 metres) as well as lesser-known peaks such as Bimberi (1911 metres, ACT).